With our free program to download you can easily synchronise your appointments with Microsoft Outlook. Microsoft .NET-Framework V. 4.6.1 has to be installed on your computer. ( Download here for free from Microsoft.) - On Windows 10 it is normally allready installed by default. For usage your CCalendar either still has to be in the 50-day test period. Or the optional module "Outlook Synchronisation" has to be activated for your organiation. (If this is not the case, you an ask your CCalendar person in charge. Unzip the program to an arbitrary place of your lokal file system. Please also note the necessary requirements in the paragraph above. With an upgrade just overwrite possible older files with the newer ones. Enter your CCalendar username and CCalendar password in the program under the menu item "Settings". We recommend to make a copy of your "Outlook.pst"-file before synchronising. So you can access he Outlook status before the synchronisation if needed. Transfer of new and already existing appointments and appointment series (incl. Serie Exceptions and Series Variants) from CCalendar into Outlok and / or vice versa. Deletion of on one side deleted appointments on the other side - after explicit confirmation of the uer. Protection against overwriting to prevent overwriting meanwhile modified appointments. Optional possibility to connect with CCalendar with a proxy server. Of course, with the synchronisation tool, you can only create or modify those appointments in CCalendar, for which you have writing rights for ALL affected appointment groups. At synchronisation only those fields will be transmited, that are available on the other side. Other (very specific) fields, the other side, if applicable, does not know, may be resetted. 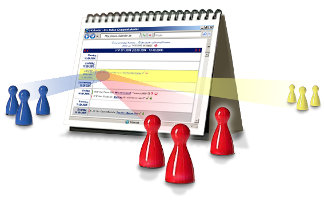 CCalendar saves the synchronisation data for every user with one Outlook account per CCalendar user account. It is not possible to switch between multiple Outlook accounts for synchronisation! However, if the user still does this, synchronisation consistency is not guaranteed anymore! CCalendar ca not process appointments before the 01.01. Such appointments will be denied at synchronisation with Outlook. CCalendar allows very individual time data in the "time" field as free text. For that reason it may happen in rare cases that some time data cannot be interpreted or converted completely. Time data in transfer direction Outlook -> CCalendar will always be in the format "hh:mm[ - hh:mm][ Unit]". With appointment series the appointment variants and exceptions will be synchronised from both sides from now on. Outlook allows multiple weekdays for weekly and monthly appointment series. CCalendar only knows one particular, single day. For this reason, when transferring appointment series with multiple selected days from Outlook to CCalendar, only the first of the weekdays is interpreted. 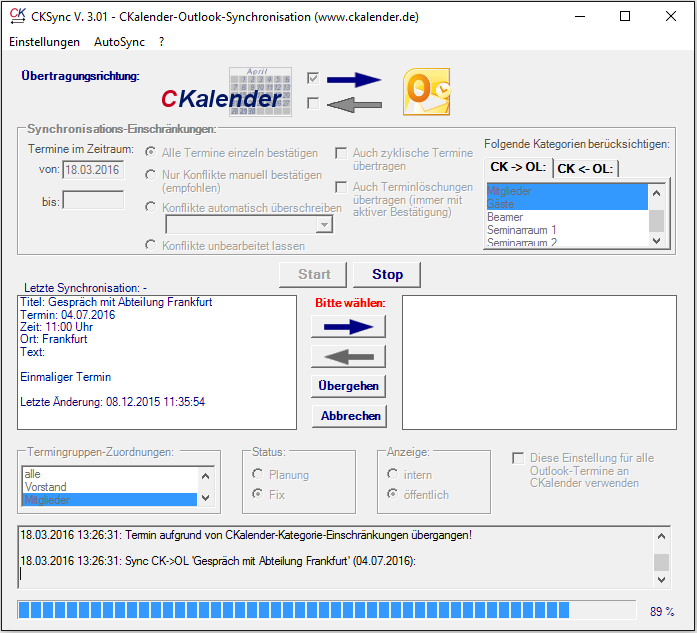 CKSync supports the distinction between different generated calendars within your Outlook since Version 2.02. CCalendar always synchronises with the curently under the menu item "Settings" defined Outlook calendar. - Changing this calendar setting is possible any time. However, please note that, when changing, all sychronisation-status-data referring to the calendar defined before, will be resetted. When changing back to the earlier defined calendar later, all appointments are synchronised again. Independent of if they have been created already earlier (before changing the calendar) or not, they will be synchronised! This way duplicate appointment entries may be generated! Afterwards click on the menu item "AutoSync" -> "Save Configuration"
In your operating sytem set up a cyclical task execution with the following command:"CKSync.exe/autosync"
Restriction: This automated synchronisation is only supported for the synchronisation direction CCalendar -> MS Outlook at the moment. "Thanks a lot. ... Such a good and professional service is without equal."